Part of my interest and practice has been in the creation of grimoric equipment. I strive to emulate each item to the dictates of the text as close as I am able. 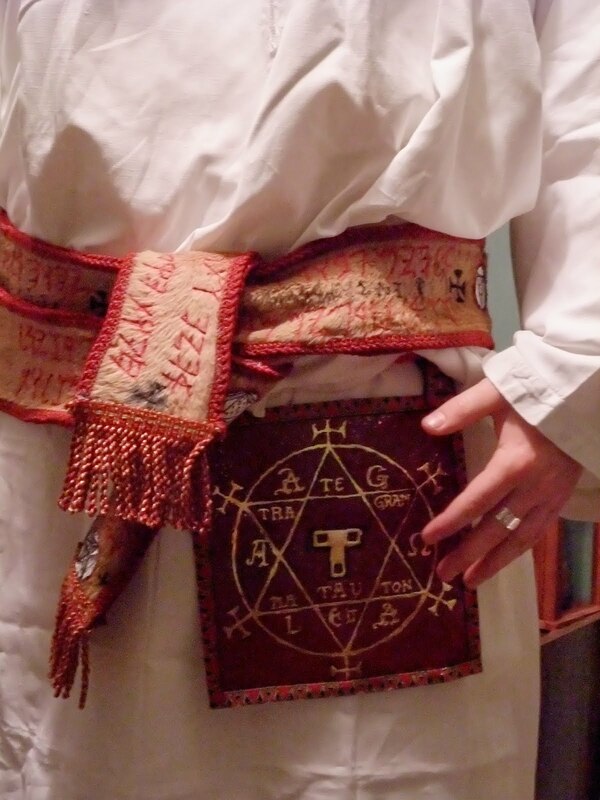 It has been my experience that the ‘Hexagram of Solomon’ or holy seal has mostly been created on pieces of hide or leather. (Weather calf’s hide from the Goetia or kid’s skin from the Heptameron) Most magicians I’ve talked to or read about, have created their seal on these types of material. I did it this way myself at first. However, this is not the type of material the medieval grimories are actually describing. There are detailed instructions for the creation of this parchment in the KoS as well as a few other select grimoires. Mg. Aaron Leitch goes into plentiful explanation and notation concerning these sections in his ‘Secrets of the Magickal Grimoires’ as I recall. As very few of us have direct experience and opportunity (not to mention a taste) for skinning animals, etc. parchment of this sort can be impractical to create. None the less, virgin parchment of THIS caliber is possible to obtain for a reasonable fee. “Parchment is a paper-like material made from sheep or goat skin. Very fine parchment is called Vellum and is made from calf skin. Parchment is not paper, as technically, paper is made from cellulose pulp. When studying the process of how parchment is made, even without the added complexities as the Key of Solomon describes, you can see an undergoing alchemical transformation. Although this type of parchment was more common during the times the versions of the grimories were recorded, the value placed on ‘virgin parchment’ is obviously apparent. From the young virgin animal, the skin becomes parchment only after a process of intense treatment and refinement. We can see shedding of the unneeded and “base” material in favor of the purified core or essence. We need not look much deeper to recognize the components of the Salt, Sulfur and Mercury.